Support your favorite American football team with a personalized screen saver or presentation. 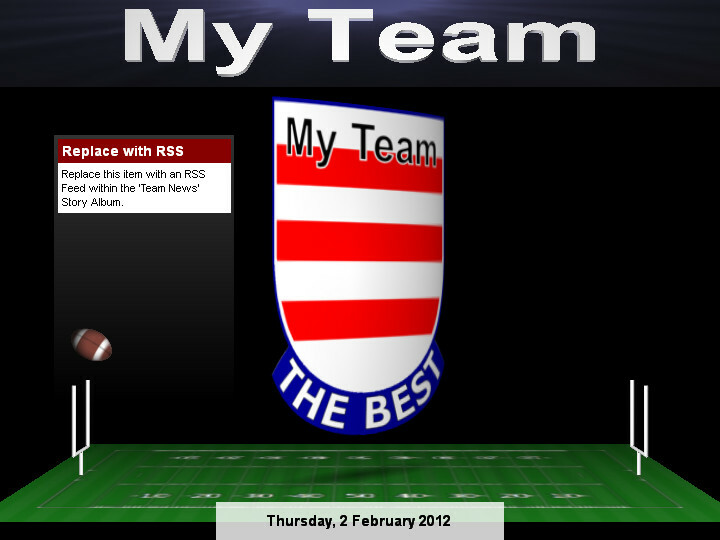 Team Logo File - Simply download your team's badge from the Internet. You can also have your team's latest news appear by specifying the web address of an RSS News Feed. When you've finished these basic steps you're ready to use it as a screen saver or presentation. Alternatively you can use this as a starting point and make your own modifications, such as adding a background picture of your team's stadium or a slide show of your favorite players. Variants: National, Conference, Professional, Championship, League, National, International, United, Playoffs. Areas US: Arizona, Atlanta, Baltimore, Carolina, Chicago, Cincinnati, Cleveland, Dallas, Denver, Detroit, Green Bay, Houston, Indianapolis, Jacksonville, Kansas, Los Angeles, Oakland, Pittsburgh, Philadelphia, Miami, Minnesota, Nashville, New Orleans, New York, San Francisco, San Diego, Seattle, St. Louis, Tampa Bay, Washington. Areas UK: Birmingham, Bournemouth, Bristol, Coventry, Crewe, Durham, Edinburgh, Essex, Glasgow, Hampshire, Leeds, London, Loughborough, Manchester, Newcastle, Nottingham, Oxford, Peterborough, Portsmouth, Plymouth, Reading, Sussex, Tamworth, Wolverhampton, Yorkshire.